Casino Limo Services. A Winning Combination. An individual doesn't have to be a big spender to use a Casinos limo services. Many people, who want to go to the Fallsview Casino or Casino Rama, will gather a couple of friends together and each pay a portion of the limo rental fee for an evening of worry free transportation. The casinos are a lot of fun and could present a profitable evening for a lucky person or several people if they play their cards right. Why not start out the night in style and without the worry of who is going to be the designated driver and let our limousine company handle the transportation needs. There are many different options for a casino evening beginning with a stretch limo which is a traditional limo that most people are familiar with. It seats anywhere from two to six or eight people comfortable. The chauffer will take care of the directions, gas and insurance so no one has to be concerned about filling up their vehicle before the big night out on the town. In addition, no one has to abstain from drinking if they wish because they need to make sure everyone gets home safely, the chauffer will take care of that. When a group of friends or family adults want to have a casino night, they simply call our limo rental company and tell us what night, which casino's they wish to visit that evening and what type of limo they would like to rent. The rental amount is based on how many people are going, which limousine they are using and how many stops the limo will be making. When a large group wants to have a casino night, they might want to consider renting a larger limousine such as a SUV limo or a Hummer limo which will seat more people. Plus, with more people, the cost goes down per person paying for the night. Some of the SUV and Hummer limos will seat up to 20 people in a great setting. These limos have a casino atmosphere in which there are lots of lights, a bar and plasma TV. The party will keep rolling no matter if someone won at the last stop or not. Most casinos are offering complementary beverages and this is a nice addition to a night on the town, however drinking and driving is a very dangerous thing. Renting a limousine so that drinking and driving is not an issue is a smart idea for everyone going on a casino road trip. 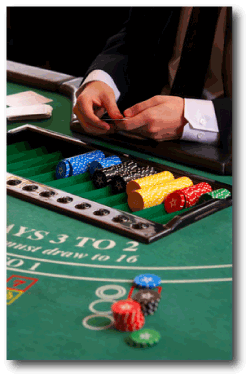 A casino evening could double as a bachelor or bachelorette party if the bride or groom enjoys the casino nightlife. All the attendants could chip in to cover their portion of the rental for the evening as part of their gift to the soon to be married individual. At each casino stop, many random people will help the party along by buying the bride or groom a drink to wish them luck and happiness.